7 Years Of U.S. Drone And Airstrikes: White House Tallies Civilian Deaths : The Two-Way Between Jan. 20, 2009, and the end of 2015, the White House says, the U.S. carried out 473 airstrikes in places that weren't in "areas of active hostilities" — such as Iraq or Afghanistan. 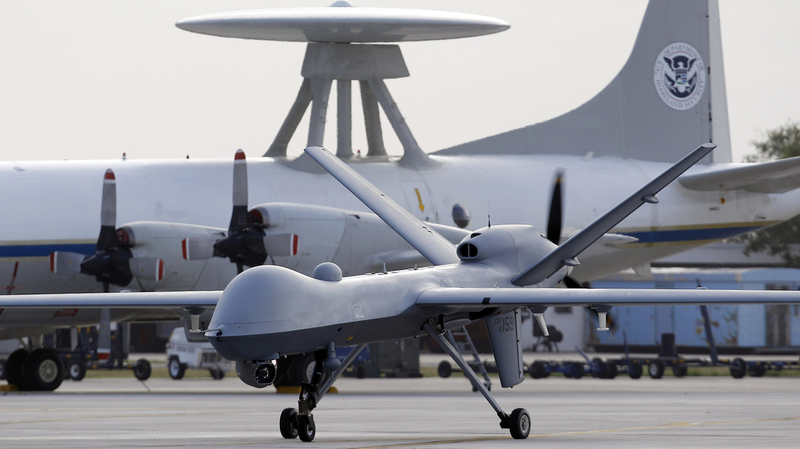 Since President Obama took office in 2009, the Predator drone and other aircraft have carried out nearly 500 strikes in areas that aren't in combat zones such as Syria and Afghanistan, according to a new official report. Since 2009, the U.S. has carried out hundreds of airstrikes in countries other than Afghanistan, Iraq and Syria, the White House says, providing new details to the often secretive strikes — many of which were carried out via unpiloted drone aircraft. 473 airstrikes carried out outside of "areas of active hostilities"
Some of those estimates, as the report from the Office of the Director of National Intelligence acknowledges, are far below the range put forth by watchdog groups that tally civilian deaths. "For instance, for the period between January 20, 2009 and December 31, 2015," the report reads, "non-governmental organizations' estimates range from more than 200 to slightly more than 900 possible non-combatant deaths outside areas of active hostilities." Concerning the official estimates' range, a senior administration official says that the gaps reflect a lack of definitive information about the victims of an attack. As it released the data, the White House also announced that President Obama has signed an executive order that requires the Director of National Intelligence office to make an annual release of aggregate figures on drone strikes, to be carried out on May 1 of each year. The order also lays out what the administration calls its list of best practices, including minimizing civilian casualties and how to respond to cases in which those casualties occur. Those best practices include achieving near certainty of two factors: that the hostile actors are present, and that civilian casualties can be avoided, White House Press Secretary Josh Earnest said at his daily briefing Friday. Concerning Obama's view of the airstrikes, Earnest said that the "president believes that our counterterrorism strategy is more effective and has more credibility" when it is increasingly transparent. But Earnest then acknowledged that transparency hasn't always been a hallmark of the nation's sensitive drone programs, saying, "These operations ... are the kinds of operations that just a couple of years ago, we wouldn't even confirm existed." He added, "I think it's an indication of how far we've come." For years, Earnest said, the White House has been working to create "an architecture for making decisions about how to use this technology." Drone technology, Earnest said, "is a tool that this administration, and this president, has used frequently, in a way that has had a devastating impact on the ability of terrorists to establish a safe haven" and plot against the United States.